The America's Response Monument – subtitled De Oppresso Liber – apparently, was located in some nearby lobby and is scheduled to be part of the Ground Zero Memorial. 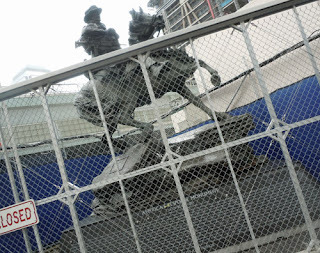 It is behind a fence by the WTC PATH station. The Freedom Tower, which I believe it is called, has risen in our horizon and is still being completed – I do not know the latest announced date of the opening– so I do not know if where the monument is now will be its permanent home or this is just a resting stop before it is again moved. I liked the idea thought however temporarily this statue is located behind a fence, amid construction equipment. Initial defeat? Is that some kind of military-speak for temporary set back at the beginning of the longest war in American history? Military monuments spark a complexity of emotions in me and yes initially I feel patriotic, and in awe of the honor and bravery commemorated. I believe or at least hope that ultimately justice was achieved. How can you not experience those feelings for the Unknown Soldier or the Vietnam War Memorial (as examples)? Wars are result from leadership failures – on both sides – the old and rich lead us to war, the young and poor die. It is always thus. I have posted about 9-11 many times and there has been too much bloody water under that bridge for me to be in a memorial-mood. I don’t feel solemn respect, I feel an unquenchable anger. I’m not saying there shouldn’t be a memorial. I just can’t let go of the bitterness, which is not just about Bush II or America, but the other side too. Islam and Islamic governments share blame; Islamic peoples were let down by their own leaders – Bin Laden came from the upper class. No matter how at fault are American – as well as Israeli and European – policies are, to say they are solely to blame for all the problems in the Mideast comes from is a dishonest and destructive idea. After 9-11, there was no other choice but to invade Afghanistan. It’s everything that happened before – and after – that continues to gall. 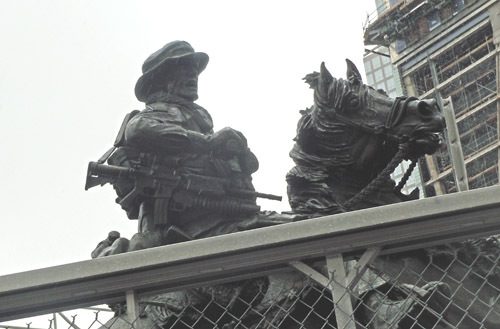 The opening chapter of the conflict had Special Forces using horses to traverse the Afghanistan Terrain, which this sculpture immortalizes. It is a vivid depiction that conveys bravery and determination. The first line of the inscription is “cowardly attacks” and I remember Bill Maher getting lambasted and forced off broadcast TV in the land of the free when he disputed the concept of someone fulfilling a suicide attack as a coward. Using the C-word not only invoked that ten year old controversy but seems to diminish the violence and tragedy of 9-11. 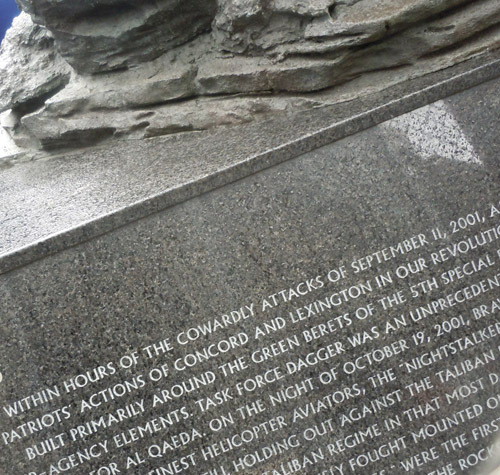 Name Calling seems out of place, seems contrary to honor and bravery and the hallowedness of this spot, where 3,000 died because they went to work on one day. The sculpture memorializes an overlooked chapter and ignored heroes of the conflict. To embed saber rattling in the memorial cheapens the sincerity of feeling it intends to convey. 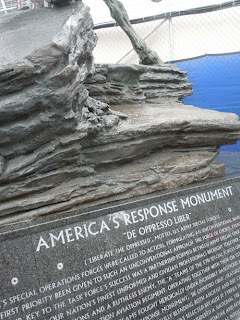 But in spite of the context, it’s a heart-stirring statue. The still-life is infused with action; there’s no way its suggestion of movement cannot affect. In its present location, the horse seems minutes away from leaping over the fence.